History: Matt's reputation as an engineer and mixer sometimes obscures the fact that he is also a capable musician. 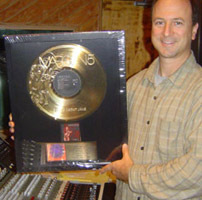 Matt has performed on many of the albums he's produced, though he rarely seeks credit for such work because he feels it is part of his role as producer. Matt sang backup vocals on albums by Faith No More, The Replacements, H20, Sugarcult, Flybanger, Khaleel, and others. He played drums on The Replacements' "Don't Tell A Soul" and on Paul Westerberg's "14 Songs". He played guitar on recordings by John Hiatt, Sheryl Crow, Bic Runga and numerous others. Matt has played percussion on many of his productions and even on quite a few of his mixes for others. Matt produced, engineered & mixed Faith No More's "Angel Dust" - which was listed in Kerrang magazine as the #1 Most Influential Album of all Time (May 2003). Matt Wallace's career in music started as a musician, playing and singing original songs in various Bay Area bands. Although he never achieved fame as a musician, singer or writer, the experience gave Matt the understanding to help bands with arrangements and chord choices as well as occasional co-writes. All this is to say that, in addition to being an accomplished engineer and mixer, Matt is a very musical producer who has a keen ear for songs and arrangements. Current Credits: Matt is currently producing Caleb Kane's forthcoming album. He just finished producing Kyle Riabko's forthcoming EP and will soon be working on his full length album. Maroon 5's Songs About Jane (P-E-M) has gone platinum!